I love going thru my photo album and looking back at the garden as it’s grown. I have almost 4,500 pictures so far, dating from 2007 to the present. I’ve been wanting to do a retrospective for some time to show how things have grown over time. So I’ve arranged 3 particular shots over the years in chronological order so we can see each section of the garden and how it’s grown over the years. Except for the first row where there is no garden, the shots are arranged to show first the front of the garden, then a side view, and finally a back sort of view. Not all these are the same shot of course, but I managed to find ones that seemed to show what I wanted pretty well. Over the time these shots encompass we go from a simple lawn with a few foundation shrubs at the back and some fruit trees to a dense garden full of plants. Unfortunately we lost both of the big Cherries and a large rhododendron. 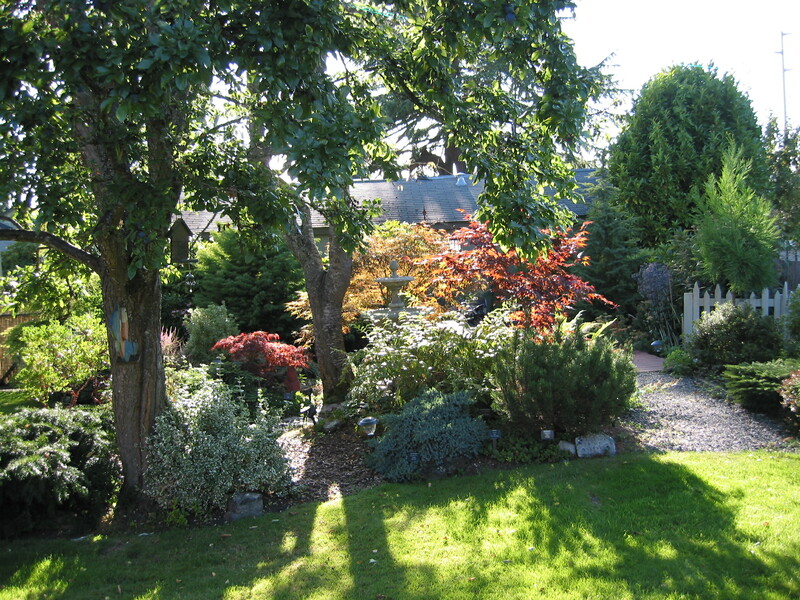 So this garden has a mixture of styles and formats due to the changing of the canopy and other factors. I might have done things differently if I’d known the trees would die, but who can know those things? I’ve tried to replace them with other trees that will be nice, but there will never be a canopy over it again. That’s OK tho, because there will be a different look to it as the conifers at the back and sides get bigger and provide an enclosure for the garden on 2 sides. Somehow I managed to have all deciduous trees in the middle of everything so in the winter the center of the garden is bare but the sides stay green, and the underplantings stay green too. It’s a nice effect. If you scroll down each line you can get a sort of slide show effect and see how each area has grown each year. Or you can click on the first one and go thru them that way so you see more. In fact I recommend you do that to see the full pictures. We’ve been lucky to get some sunshine lately and I happened to be out in the back yard the other day when I saw this shot. So I went in and grabbed my camera and took a few photos. (You can click on them to get a larger size shot). I was struck by how beautiful the Japanese Maples look in this picture. From the left is a small dark red one called Red Dragon. It’s a Dissectum type maple and is supposed to be “the best red dissectum”. I’m leery of superlatives but I will say it’s quite beautiful tho it hasn’t grown much in the 4 years it’s been here. But I like it just fine as it stays this dark red all summer long. The one in the middle is called Red Pygmy and is a Linearlobum type maple. It has strap like leaves that are deeply cut, almost like a dissectum but not as much so. This tree looks almost bronzy golden in the sun but its leaves are actually a light burgundy and look lovely. This tree has grown immensely from a small stick to over 6 feet by 7 or 8 wide. It turns a spectacular golden in the fall. 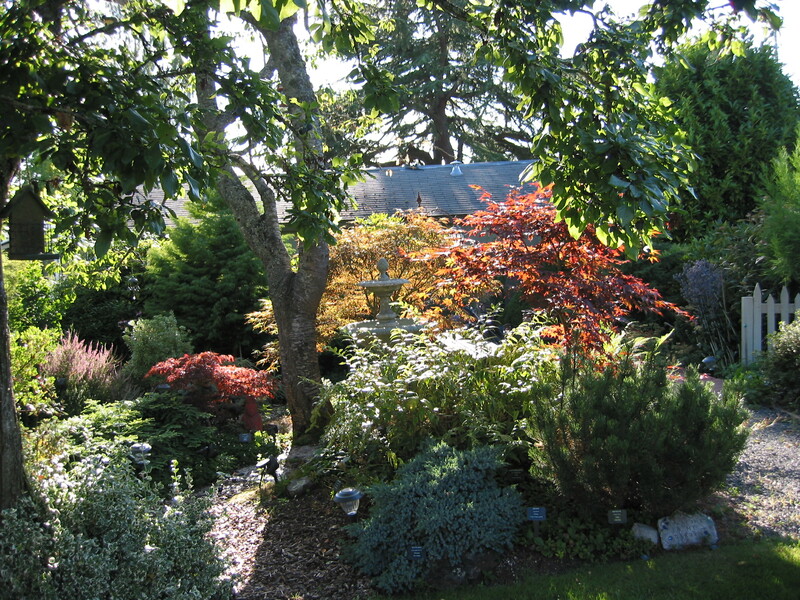 The third one on the right is a classic Palmatum type of maple called the Bloodgood. It’s an Old standard that has been in cultivation in this country since the Civil War and is named for the Bloodgood Nursery on Long Island in the late 1700’s. It gets to 20 feet tall as opposed to 10′ for the Red Pygmy so it’ll get larger here and fill the space it has to grow into fine. You can see several other plants in this shot. On the far right is a newish favorite of mine from just a year ago. In that time it’s grown 4 feet and is amazing. It’s a Cryptomeria called Radicans. I have several of the Cryptomerias and I love them all. All are unique and interesting. On the far left is a spreading yew, or Taxus repandens. It’s grown quite a lot in its years here and is a low dark green presence at the corner of the yard. Next to it on the right is a Wintercreeper called Gaiety, or Eunoymus fortunei. It’s trying to grow up the Plum but I’m not letting it do so. To the left of the Plum is a Manzanita called Howard McMinn that shows off its reddish bark for you tho it’s a bit hard to see. I’ll do a full shot of it soon and show a bit more of it. In the center of this shot is a Leucothoe fontanesiana called Rainbow that turns lovely purples and reds in the fall, tho not as much as I expected. I love the fountain like display it puts on. It loves the water it gets when we clean the fountain too. In this next shot of the garden a few steps closer, you can see the maples better and also the Blue Star juniper in the middle of the front row. Next to it is a Mugho Pine called Pumilio. It’s done well so far but not gotten too big which is fine with me. It holds down the corner of the garden there near the path. I should mention the two big trees you can see as trunks are an Italian Plum on the left that feeds many of the food bank folks we give the plums to. We like to eat them too but we get so many it’s good we can share them with others. The other tree trunk is a Queen Anne cherry that gives a lot of fruit to the birds but we rarely get any of them. Oh well, it’s a lovely tree and gives some shade to the otherwise open garden. 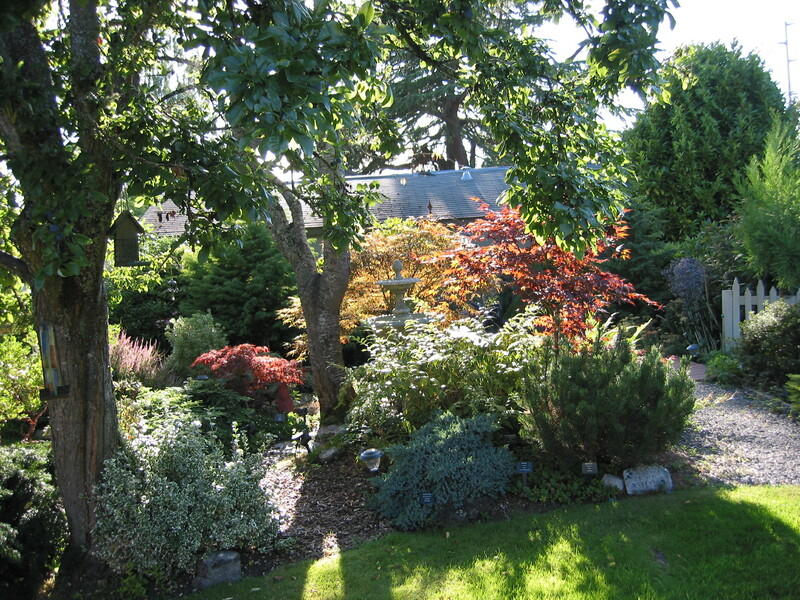 This is the closest picture of the garden and in it you can see the Heather blooming in the left of the shot, and next to it is another Cryptomeria called Elegans, for its elegant look and soft quality of its leaves. I’ve profiled it before and it’s one of my “Petable” trees. It’s grown from about 1 foot and 1/2 to over 9 feet in 5 years. Wow! I’m impressed. Also here are on the right side you can see the Variegated Sea Holly with its purple cast of blooms near the white picket fence. It’s the most bee friendly plant I have in that it attracts several varieties of bees and is covered in them at times in the sun. What spectacular sights to see and it holds its color for several months quite nicely. Also in the middle of the shot is the Coast Redwood I profiled a week ago – the Kelly’s Prostrate. It’s just to the left of the Red Dragon maple in front of the Heather.